I am absolutely loving the ruffled, fluted hem trend that has infiltrated the fashion scene. While this style is in no way new, it is making a serious comeback this Fall. 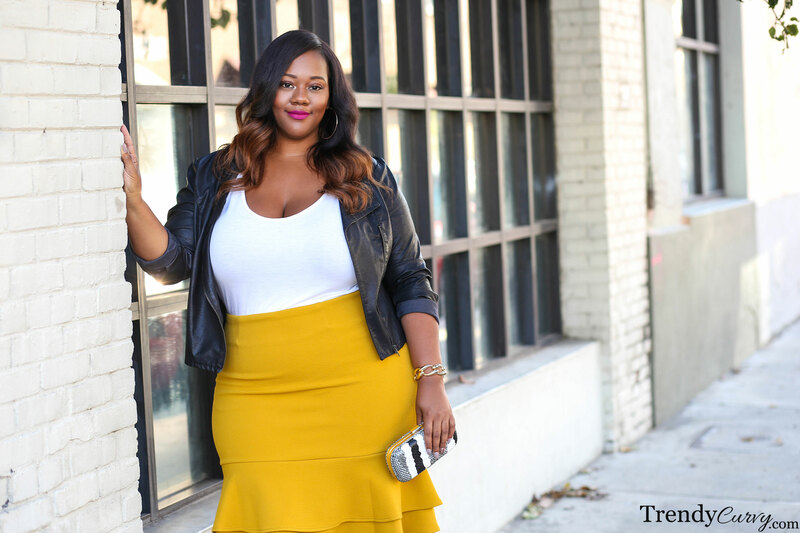 For me, it started with this flounce skirt from New York & Company’s new plus size line and it is continuing with this mustard beauty from Modcloth. The color is divine and the two tier ruffle is flirty, feminine and fun! I think that one of the most interesting things when it comes to styling looks is the ability to mix and match elements that aren’t traditionally paired together. This principle can go for colors, patterns and of course garment styles. I wanted to create a little “ying and yang” when it came to this outfit by contrasting the frilly skirt with an edgy moto jacket. It’s a bit unexpected yet it blends seamlessly. To add to the edgy flair, I went with lace up black sandals and a black & white snake skin clutch to tie it all together. This is the best of both worlds! *Fit notes: Skirt has a good amount of stretch that allows it to go nicely over the hips. Wearing a size 1x and it fits like a glove. Kristine, you are my inspiration. I log on daily to see what you have in store. Keep up, doing what you are and do not change a thing. #I love it!!! 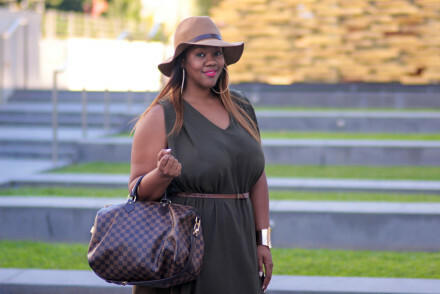 Kristine, new to the blog and I love your style! Where is the shirt from? Kristine, this color has been my favorite this season. I actually got a dress in this color, because it especially make dark skin girl’s color pop. 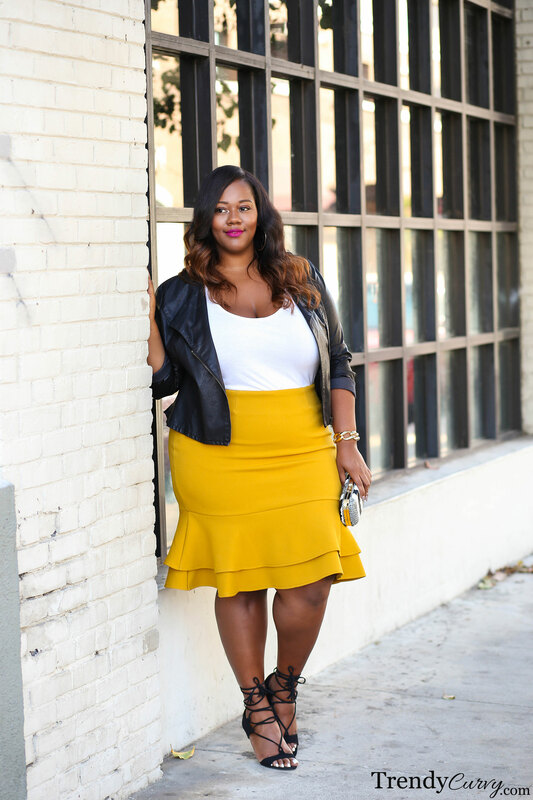 The ruffles on the skirt is cute too, and I’m loving the leather jacket, werk it girl! I just have to say I enjoy reading your blog so much! Your outfits are always so amazing and I love your confidence and style! You definitely inspire me!! Doing it so well as always, loving this look. Kristine, I love the color and design of the skirt. Beautiful combination. Adore this color, you look absolutely beautiful in this look! ?